This is College Physics Answers with Shaun Dychko. Absolute pressure is gauge pressure plus atmospheric pressure. So we can solve for gauge pressure by subtracting pressure of the atmosphere from both sides. So if gauge pressure is the absolute pressure minus atmospheric pressure, so that's seven times ten to the five Newtons per square meter minus atmospheric pressure also written in Newton per square meter. And we get this answer here. 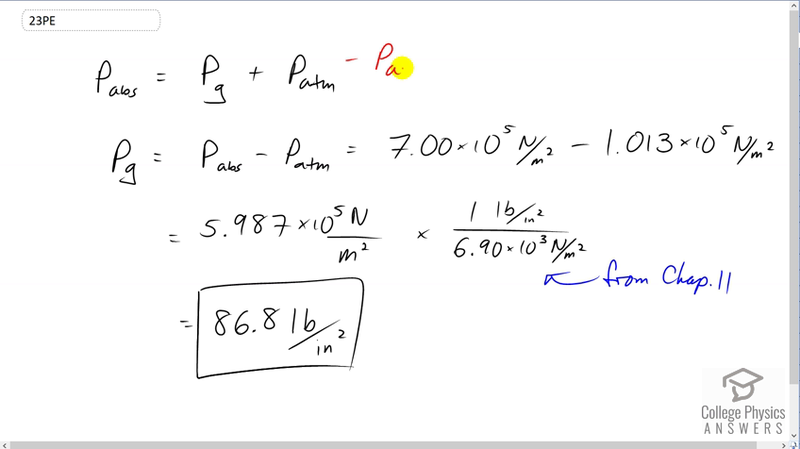 And then we have to convert to pounds per square inch by using a conversion factor from Chapter 11. And there's one pound per square inch for every 6.90 times ten to the three Newtons per square meter. And this works out to 86.8 pounds per square inch.